Teams from nearly 3,000 universities hailing from 102 countries competed for the top prizes. St. Petersburg State University, Shanghai Jiao Tong University, Harvard University and Moscow Institute of Physics and Technology were the top medal winners in the 2016 Association for Computing Machinery (ACM) International Collegiate Programming Contest (ICPC), which concluded May 19 in Thailand. 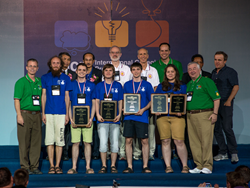 The top 2016 ACM-ICPC winners were students from St. Petersburg State University in Russia. ACM-ICPC, the premier global competition for programming, aims to recognize the best and the brightest young programmers from universities around the world. The global competition is conceived, operated and shepherded by ACM, sponsored by IBM and headquartered at Baylor University. As the world’s largest, oldest and most prestigious programming contest, ACM-ICPC attracts and unites a diverse group of young coding participants in competition. Teams from nearly 3,000 universities hailing from 102 countries competed for the top prizes. The 2016 ACM-ICPC World Finals pits teams of three university students against nine complex problems and a demanding five-hour deadline. St. Petersburg State University successfully solved 11 problems to earn first place. Contestants tackle an array of computing challenges requiring significant analysis, planning, collaboration, creative coding and an ability to innovate under grueling time pressure to solve the complex problems. Full results of the competition are available at http://icpc.baylor.edu/worldfinals/results. Headquartered at Baylor University, the ACM-ICPC is a global competition among the world's university students, nurturing new generations of talent in the science and art of information technology. For more information about the ACM-ICPC, including downloadable high resolution photographs and videos, visit ICPC headquarters and ICPCNews. Additional information can be found via the "Battle of the Brains" podcast series. Follow the contest on Twitter @ICPCNews and #ICPC2016.